A Dairy Dreamer's Perfect Wisconsin Cheese Board | Blog | Di Bruno Bros. Imagine my delight when I learned that my favorite cheese shop was showcasing cheeses of Wisconsin! Before moving to Philadelphia nearly ten years ago, I was a ‘Sconny grrrl, living the dairy dream in the state capital. It was a life of cheese curds and bratwurst, of beer and Harley-Davidsons (Wisconsin’s other claim to fame). In Wisconsin, it’s rare to visit someone’s home without being offered a cold brew and a cheese plate. The state’s enormous cheese industry is a source of pride. At the college I attended – downwind from a cheese factory – we even had a school song that paid homage to the “cheese breeze.” Yes, I can still smell it wafting through the windows during final exams – a toasty, yeasty aroma like the smell of pizza, minus the oregano. Of the 40 Wisconsin cheeses now glowing in the Di Bruno Bros. cooler, I’ve selected four favorites for a special cheese board. Friends, these are the cheeses I always eat when I visit family back home. How lovely to find them within arm’s reach now. I hope you enjoy tasting them, too, along with a few of my favorite pairings. In Holland, it’s not unusual to find Gouda loaded with nutty tasting fenugreek seeds, a perfect addition to the caramel notes in this style of cheese. Think of how almonds enhance toffee, and you’ll understand why this combo might jive. Holland’s Family Creamery is a farmstead dairy run by Marieke Penterman and her husband Rolfe. After moving to Wisconsin from the Netherlands, they became first-generation dairy farmers, raising their own herd and making Dutch-style cheeses. Theirs is a very traditional operation; all of their equipment is imported from Holland, and they use fresh raw milk and animal rennet. 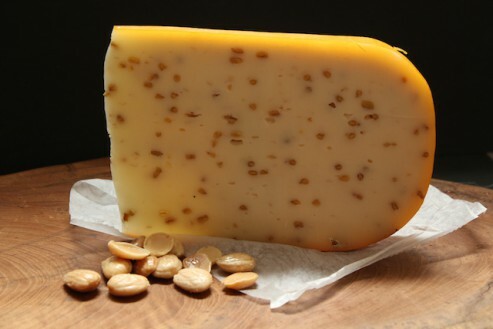 Pairing/Serving: To play up the nutty notes in Marieke Gouda with fenugreek, I love to serve this cheese with Marcona almonds, which are delicate and sweet. Apricots and a six-pack of nut brown ale pairs wonderfully, too. Little Darling is earthy and mellow with a beautiful natural rind, the sort of cheese you might expect to find in rural England or Wales. I learned about it from Di Bruno Bros. cheesemonger Rich Morillo, who sampled it on a cheese board in Chicago and emailed me excitedly to find out what I knew. I hadn’t heard of it (this was several years ago), but soon after, I received an inquiry from Little Darling’s maker, Joe Burns. He saw my blog, noticed my last name was “Darlington,” and wondered if I might like a long-distance nosh. The beautiful wheel he sent to my stoop from his century-old cheese factory nearly made me weep. You can read about it here and see the painting that it later inspired! 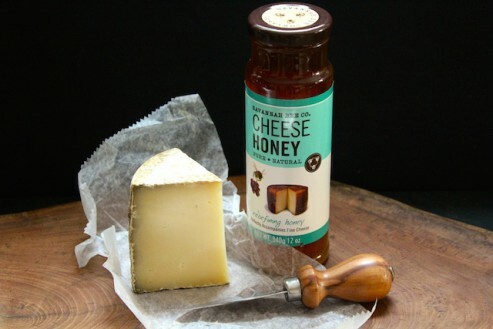 Pairing/Serving: Rustic, with notes of hay, earth, and even a little horseradish, this darling is great with a drizzle of honey. It’s a perfect ploughman’s lunch cheese, great with crusty dark bread and a pint of Fuller’s ESB. Cheddar has been produced in Wisconsin since the 1800s, and it’s so beloved that you can pretty much buy local Cheddar everywhere, even in gas stations. Travel through Wisconsin, and you’ll see signs boasting, “Cheese! Fireworks! Next Exit!” – it never gets old. Of the many Cheddars made in the state, Widmer’s is a stand-out. Third-generation cheesemaker Joe Widmer is one of the state’s Master Cheesemakers, a designation that requires three years of intense training. His 4-year and wickedly bitey 10-year are buttery in texture and biscuit-crumbly, just as fine Cheddar should be. 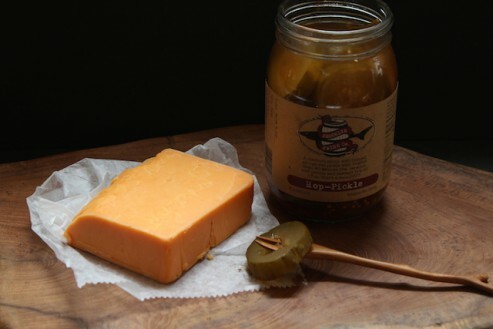 Pairing/Serving: I associate sharp Cheddar with hops and pickles (Cheddar and IPA tastes great together, so does Cheddar with bread’n butter pickles). When I saw that Di Bruno Bros. carried a hoppy pickle, I just about lost my mind. Add some whole grain bread, summer sausage, apples, and mustard, and you’ve got a perfect picnic. Few blue cheeses are made solely from goat cheese, which is what makes this tangy blue so special. Goat’s milk is not very fatty, which is why it’s often used in light cheeses, like chèvre. To create a deeply creamy blue from goat’s milk takes skill, the know-how of a guy like fourth-generation cheesemaker Sid Cook. Cook uses the milk of pastured goats, building on grassy flavors from Wisconsin’s rolling hills, to create a blue cheese with verve. The first time I spotted this cheese, it was in a case at Dean & DeLuca in New York, right around the time I launched my own cheese blog. I created Billy Blue Bison Burgers for one of my first posts, and I’ve had a soft spot for this bold blue ever since. 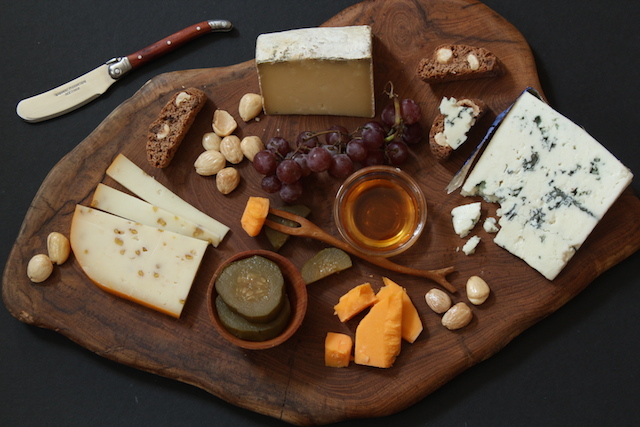 Pairing/Serving: Because this cheese is so versatile, I use it in everything, from salads to blue-cheese crostini with toasted walnuts and honey. After dinner, I love to serve a hunk of blue cheese for dessert, with fresh fruit, nuts, and dark chocolate. 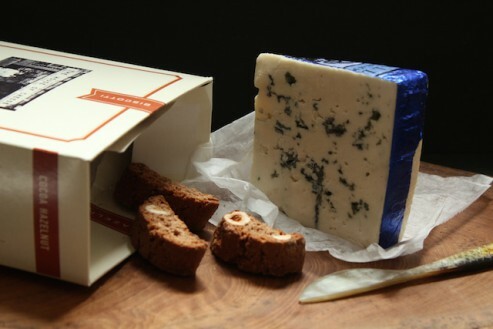 For special occasions, I like to serve blue cheese with biscotti and an Italian dessert wine, like Passito, or with a glass of Madeira or tawny Port.